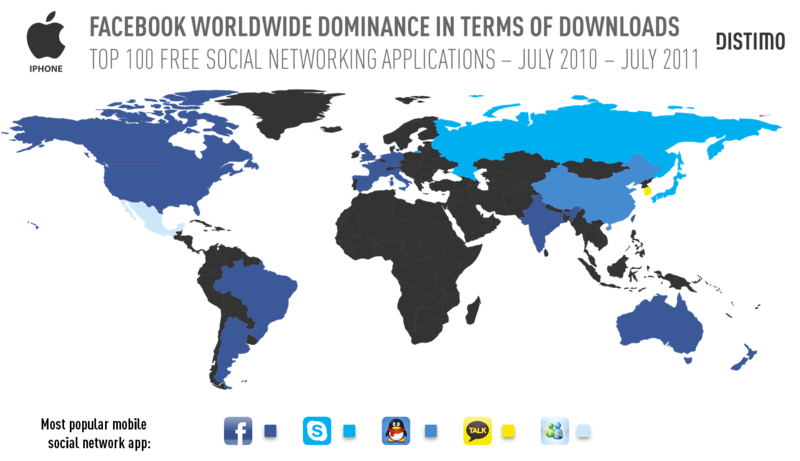 Based on downloads, Facebook’s iPhone app was no longer the most popular mobile social networking app in many Asian countries and elsewhere from July 2011 to June 2012. This, according to the latest report from app store analytics firm Distimo, which took a look at trends surrounding mobile social networking applications over the past two years. Distimo found that apps like LINE, WeChat and Viber took over the leading position of Facebook in some countries, and Instagram become the second most popular app on iPhone within one year, after examining data aggregated over the 20 largest countries. In addition, in July 2012, Instagram had more downloads than Facebook, and apps like Twitter, Skype and Whatsapp were also popular. Downloads, which is what Distimo is using to measure popularity, do not equate to users. Distimo is looking at mobile apps, and specifically iPhone apps, not the networks’ overall user base and reach. Facebook’s app has been around for several years, so adoption is already high. Users don’t need to continue to download an app they already own and use. Distimo did not look at every country worldwide for this report. The countries selected cover all regions and were chosen based on market size – that is, the largest markets were taken into account. The countries examined in the report include: Argentina, Australia, Brazil, Canada, China, France, Germany, Hong Kong, India, Italy, Japan, Mexico, Netherlands, New Zealand, Korea, Russia, Singapore, Spain, Taiwan, United Kingdom, and the United States. During the period of July 2010 through June 2011, Distimo found that Facebook was more dominant than it is now. In only five of the researched countries, it was not the most popular social networking app. But in three of those five, it was still in the top 5 most popular apps. It hadn’t cracked the top 5 in China and South Korea during that time. Among paid apps, Whatsapp Messenger was the number one app in all countries except Japan, where it was number two. However, from July 2011 to June 2012, Facebook’s dominance was not as apparent. While it was still the most popular social networking app by far, other social networking apps had taken over in some countries. LINE was the most popular app based on downloads in Japan, Taiwan and Singapore, while Viber took off to become the most popular app in Spain and Australia. In China and Hong Kong, WeChat was downloaded the most, and in South Korea, KakaoTalk was the most popular, as it was the year before. The top 10 aggregated over these countries were (in order): Facebook, Instagram, Viber, Skype, Facebook Messenger, Twitter, LINE, Google+, WeChat and Windows Live Messenger. You’ll notice that Facebook actually owns several slots in the top 10 there: it offers Facebook Messenger and it acquired Instagram as well. Among paid apps, Whatsapp, again, was the most popular, but as a paid application, it can’t grow all that large. On average, paid apps have between 14x and 40x fewer downloads, the report notes. However, whenever Whatsapp goes on sale, it tends to end up in the top 25 list in many countries. 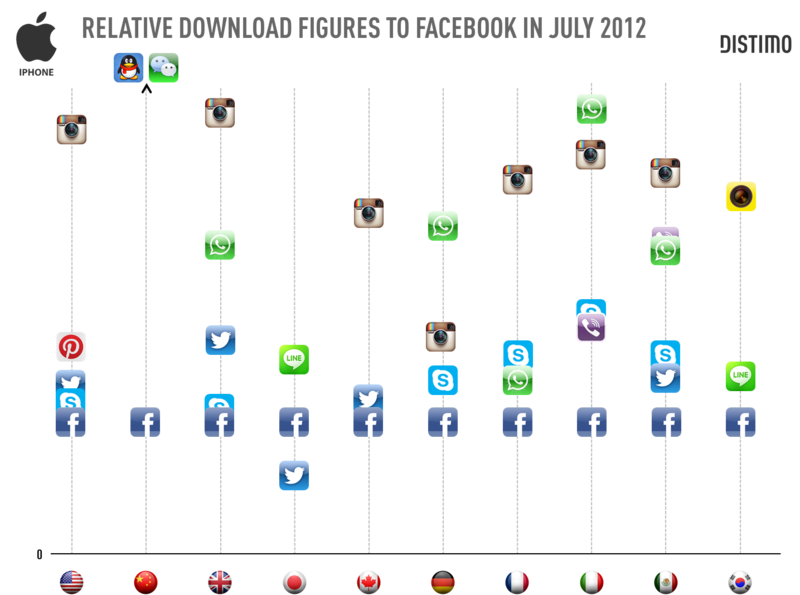 Looking at just the past month (July 2012), Distimo benchmarked the download figures of other social networking apps with Facebook in ten major countries. This chart (below) uses Facebook as an index, and all the social networking apps that generated more downloads in July were plotted. The chart shows the popularity of Instagram in several countries, like the U.S., U.K., Canada, Mexico, France and Italy, for example. But it was not popular in China, Japan and Korea. Skype and Whatsapp were also doing better than Facebook in some of these countries. (Note that Whatsapp was on sale during the month). LINE is doing better than Facebook in Japan and Korea, while Kakao Story is most popular in Korea. In China, Facebook saw fewer downloads than QQ and WeChat, which had 5x-6x more during the month. Again, and because this data could be misinterpreted: Distimo is measuring iPhone app downloads, not total users, active users, engagement, or the social networks’ total user base. This does not show that Facebook is losing its overall popularity – in some markets, it’s about reaching saturation and seeing its growth slow. For example, in July, Twitter, Skype and Pinterest saw more downloads than Facebook did in the U.S.
Social networking is a popular app category, especially in the U.S. Over the past two years, as the download volumes among the top 100 most popular apps grew by 43%, the volume among social networking apps grew by 193%. However, social networking is not as popular in other countries as it stateside. The volume among the top 100 most popular social networking apps compared to the top 100 most popular apps in general (across countries) varies between 7% and 20%. The U.S. is at the top there (20%), while Europe and South East Asia are the least socially-minded. More data can be found in the full report here.